^ Indigenous people across Australia and other settler societies - Canada, New Zealand and South Africa - did not gain equal access to their repatriation benefits and military wages. 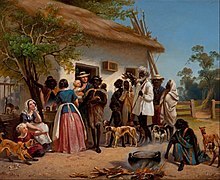 In contrast to other Australian states, Aboriginal authorities in Victoria did not systematically deny Aboriginal people military allotments and pensions, but judged each case on its 'merits'. ^ Adcock, Gregory; 等. Mitochondrial DNA sequences in ancient Australians: Implications for modern human origins. ^ 3.0 3.1 "When did Australia's earliest inhabitants arrive? ", University of Wollongong, 2004. Retrieved 6 June 2008. ^ Rasmussen, M.; Guo, X.; Wang, Y.; Lohmueller, K. E.; Rasmussen, S.; Albrechtsen, A.; Skotte, L.; Lindgreen, S.; Metspalu, M.; Jombart, T.; Kivisild, T.; Zhai, W.; Eriksson, A.; Manica, A.; Orlando, L.; de la Vega, F. M.; Tridico, S.; Metspalu, E.; Nielsen, K.; Avila-Arcos, M. C.; Moreno-Mayar, J. V.; Muller, C.; Dortch, J.; Gilbert, M. T. P.; Lund, O.; Wesolowska, A.; Karmin, M.; Weinert, L. A.; Wang, B.; 等. An Aboriginal Australian Genome Reveals Separate Human Dispersals into Asia. Science. 2011, 334 (6052): 94. doi:10.1126/science.1211177. ^ Hodge, Robert. Aboriginal truth and white media: Eric Michaels meets the spirit of Aboriginalism. The Australian Journal of Media & Culture. 1990, 3 (3). 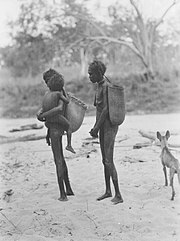 ^ 11.0 11.1 11.2 Gough, Myles (11 May 2011) Prehistoric Australian Aboriginal populations were growing. Cosmos Magazine. ^ Pardoe, C. Becoming Australian. Before Farming. 2006, 2006: 1. doi:10.3828/bfarm.2006.1.4. ^ Huxley, Thomas. On the Geographical Distribution of the Chief Modifications of Mankind. Journal of the Ethnological Society of London. 1870. ^ Aborigine – Definition and More from the Free Merriam-Webster Dictionary. Merriam-webster.com (31 August 2012). Retrieved 2 August 2013. ^ Communicating Positively: A guide to appropriate Aboriginal terminology (PDF). NSW Health. [3 August 2013]. ^ Dead Reckoning: a guide to family history research in WA: Aboriginal People. State Library of Western Australia. [3 August 2013]. ^ Appropriate Terminology, Indigenous Australian Peoples (PDF). General Information Folio 5. Flinders University, Adelaide, Australia. [10 May 2011]. （原始内容 (PDF)存档于2011年4月6日）. ^ Ethnologue report for language code: ulk. Ethnologue.com. [9 August 2009]. ^ Aboriginal and Torres Strait Islander population, Australian Bureau of Statistics 2004. Retrieved 2007-06-21. 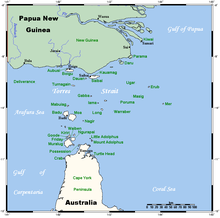 ^ 20.0 20.1 20.2 Places – Torres Strait Islands ABC Radio Australia website, 2005. Retrieved 21 June 2007. ^ 08 Nov 1828 – Classified Advertising. Trove.nla.gov.au. [13 August 2013]. ^ Dylan Bird. Andrew Bolt On Trial On Racism Charges. The Sydney Morning Herald. [13 August 2013]. ^ 23.0 23.1 Rasmussen, M.; Guo, X.; Wang, Y.; Lohmueller, K. E.; Rasmussen, S.; Albrechtsen, A.; Skotte, L.; Lindgreen, S.; Metspalu, M.; Jombart, T.; Kivisild, T.; Zhai, W.; Eriksson, A.; Manica, A.; Orlando, L.; de la Vega, F. M.; Tridico, S.; Metspalu, E.; Nielsen, K.; Avila-Arcos, M. C.; Moreno-Mayar, J. V.; Muller, C.; Dortch, J.; Gilbert, M. T. P.; Lund, O.; Wesolowska, A.; Karmin, M.; Weinert, L. A.; Wang, B.; 等. An Aboriginal Australian Genome Reveals Separate Human Dispersals into Asia. Science. 2011, 334 (6052): 94–98. doi:10.1126/science.1211177. ^ 24.0 24.1 Callaway, E. First Aboriginal genome sequenced. Nature. 2011. doi:10.1038/news.2011.551. ^ Bowler, J. M.; Johnston, H.; Olley, J. M.; Prescott, J. R.; Roberts, R. G.; Shawcross, W.; Spooner, N. A. New ages for human occupation and climatic change at Lake Mungo, Australia. Nature. 2003, 421 (6925): 837–40. Bibcode:2003Natur.421..837B. PMID 12594511. doi:10.1038/nature01383. ^ Olley, J. M.; Roberts, R. G.; Yoshida, H.; Bowler, J. M. Single-grain optical dating of grave-infill associated with human burials at Lake Mungo, Australia. Quaternary Science Reviews. 2006, 25 (19–20): 2469–2474. Bibcode:2006QSRv...25.2469O. doi:10.1016/j.quascirev.2005.07.022. ^ 27.0 27.1 Adcock, G. J.; Dennis, E. S.; Easteal, S.; Huttley, G. A.; Jermiin, L. S.; Peacock, W. J.; Thorne, A. Mitochondrial DNA sequences in ancient Australians: Implications for modern human origins. Proceedings of the National Academy of Sciences. 2001, 98 (2): 537–42. Bibcode:2001PNAS...98..537A. PMC 14622. PMID 11209053. doi:10.1073/pnas.98.2.537. ^ Cooper, A. Human Origins and Ancient Human DNA. Science. 2001, 292 (5522): 1655–6. PMID 11388352. doi:10.1126/science.292.5522.1655. ^ Smith, C. I.; Chamberlain, A. T.; Riley, M. S.; Stringer, C.; Collins, M. J. The thermal history of human fossils and the likelihood of successful DNA amplification. Journal of Human Evolution. 2003, 45 (3): 203–17. PMID 14580590. doi:10.1016/S0047-2484(03)00106-4. ^ "The spread of people to Australia – Australian Museum". australianmuseum.net.au. ^ Australia's Megafauna Coexisted With Humans. ScienceDaily. 31 May 2005. ^ 37.0 37.1 McEvoy, B. P.; Lind, J. M.; Wang, E. T.; Moyzis, R. K.; Visscher, P. M.; Van Holst Pellekaan, S. M.; Wilton, A. N. Whole-Genome Genetic Diversity in a Sample of Australians with Deep Aboriginal Ancestry. The American Journal of Human Genetics. 2010, 87 (2): 297–305. doi:10.1016/j.ajhg.2010.07.008. ^ Irina Pugach; Frederick Delfin; Ellen Gunnarsdóttir; Manfred Kayser; Mark Stoneking. Genome-wide data substantiate Holocene gene flow from India to Australia. PNAS. January 14, 2013, 110 (5): 1803–1808. PMC 3562786. PMID 23319617. doi:10.1073/pnas.1211927110. ^ National Heritage Places – Budj Bim National Heritage Landscape. Australian Government Department of Sustainability, Environment, Water, Population and Communities. [13 August 2013]. ^ MacKnight, C. C. Macassans and the Aboriginal past. Archaeology in Oceania. 1986, 21: 69–75. doi:10.1002/j.1834-4453.1986.tb00126.x. 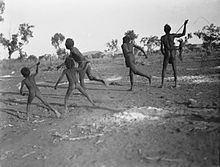 ^ Thomson, Neil (2001) "Indigenous Australia: Indigenous Health", p. 153 in James Jupp (ed), The Australian people: an encyclopedia of the nation, its people and their Origins, Cambridge University Press. ISBN 0-521-80789-1 This article says the likely aboriginal population of Australia in 1788 was around 750,000 or even over a million. There was also a chart from the Australian Bureau of Statistics – Experimental Projections of the Aboriginal and Torres Strait Islander Population, Canberra, ABS, 1998 – with estimated populations for each state and for Australia as a whole total being 418,841. ^ Gadian Society. Aboriginal. Gadian Society. [25 September 2013]. ^ "Map of Aboriginal Australia". ecu.edu.au. ^ Glynn, Ian; Glynn, Jenifer. The life and death of smallpox. Cambridge University Press. 2004: 145–146. ISBN 0-521-84542-4. ^ Sydney Barani. Aboriginal People and Place. Barani: Sydney's Aboriginal History. City of Sydney. 2013 [1 August 2013]. （原始内容存档于2014年2月8日）. ^ History. Blackwell-p.schools.nsw.edu.au. Retrieved 25 September 2010. ^ Infobase 互联网档案馆的存檔，存档日期2006-08-21.. Hi.com.au. Retrieved 25 September 2010. ^ Campbell, Judy. Invisible Invaders: Smallpox and Other Diseases in Aboriginal Australia, 1780–1880. [22 November 2010]. ISBN 0-522-84939-3. 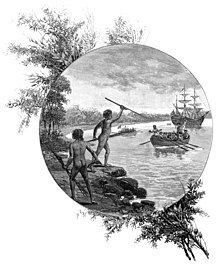 ^ Warren C. Could First Fleet smallpox infect Aborigines? – A note. Aboriginal History. 2007, 31: 152–164. ^ 53.0 53.1 Warren, C. Smallpox at Sydney Cove – who, when, why?. Journal of Australian Studies. 2013, 38: 68–86. doi:10.1080/14443058.2013.849750. ^ Mear C. The origin of the smallpox outbreak in Sydney in 1789. Journal of Royal Australian Historical Society. 2008, 94 (1): 1–22. ^ Spooner, P. G.; Firman, M.; Yalmambirra. Origins of Travelling Stock Routes. 1. Connections to Indigenous traditional pathways. The Rangeland Journal. 2013, 32 (3): 329. doi:10.1071/RJ10009. ^ The Australian Eleven: The first Australian team, National Museum of Australia. Retrieved 19 May 2011. ^ Year Book Australia, 2002. Australian Bureau of Statistics. 2002 [23 September 2008]. ^ Londey, Peter. 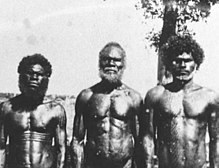 Indigenous Australian servicemen. Australian War Memorial. [17 August 2014]. ^ Appeal for Justice: Dhakiyarr Wirrpanda. Uncommonlives.naa.gov.au. 20 October 2004 [12 October 2009]. （原始内容存档于5 May 2010）. ^ Tuckiar v R (1934) 52 CLR 335. Retrieved 12 March 2011. 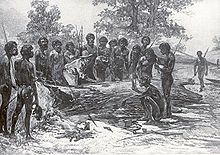 Dhakiyarr is named "Tuckiar" in the proceedings and is referred to in the main judgment as "a completely uncivilised aboriginal native". The decision is unanimous and strongly criticises the conduct of the trial. ^ GF's Koori History Website – Koori History Images – 1930s. Kooriweb.org. 26 January 1938 [12 October 2009]. ^ Australian War Memorial – Encyclopedia. Awm.gov.au. [12 October 2009]. ^ Collaborating for Indigenous Rights 1957–1973, National Museum of Australia. Retrieved 19 June 2011. ^ Australian Electoral Commission: Indigenous people and the vote. aec.gov.au. Retrieved 19 June 2011. ^ Collaborating for Indigenous Rights: Freedom Ride, 1965, National Museum of Australia. Retrieved 19 June 2011. ^ Collaborating for Indigenous Rights: Wave Hill walk off, 1966–67, National Museum of Australia. Retrieved 19 June 2011. ^ "From Little Things Big Things Grow" song lyrics. Paulkelly.com.au (1 September 2010). Retrieved 20 November 2011. ^ Timeline: 1960-69: 1967, 27 May referendum. National Museum of Australia. 13 July 1968 [12 October 2009]. （原始内容存档于10 May 2013）. ^ Civics and Citizenship Education: Sir Douglas Nicholls. Civicsandcitizenship.edu.au. 14 June 2005 [29 January 2017]. ^ 'I am the first!' Linda Burney proclaims history for Indigenous people, women. Australian Broadcasting Corporation. 3 July 2016 [23 July 2016]. ^ Norman, Jane. Bill Shorten keeps Kim Carr on frontbench in shadow ministry shuffle. Australian Broadcasting Corporation. 22 July 2016 [23 July 2016]. ^ Arthur Beetson OAM (PDF). [3 March 2010]. （原始内容 (PDF)存档于20 January 2012）. ^ The International Rugby Hall of Fame. Rugbyhalloffame.com. 9 October 2007 [12 October 2009]. （原始内容存档于10 September 2012）. ^ Thorley, Peter. Colliding worlds: first contact in the western desert, 1932–1984. reCollections.nma.gov.au. 2006 [29 January 2017]. ^ McKenna, Mark. First Words: A Brief History of Public Debate on a New Preamble to the Australian Constitution 1991–1999 (Research Paper 16 1999–2000). Parliament of Australia, Parliamentary Library. 4 April 2000 [12 October 2009]. （原始内容存档于16 February 2012）. ^ Brennan, Frank. The History of Apologies Down Under. Thinking Faith – online journal of the British Jesuits. 21 February 2008. （原始内容存档于2 December 2014）. ^ Wood, Asmi. Constitutional Reform 2013: What are we trying to achieve?. Alternative Law Journal. 2012, 37 (3): 156. ^ Pratt, Angela. Research Note no. 5 2003–2004. ATSIC Review: Complex Challenges, No Simple Solutions. Parliament of Australia, Parliamentary Library. 11 August 2003. （原始内容存档于3 February 2012）. ^ Gibson, Joel. One policy, two camps – the takeover rift. The Sydney Morning Herald. 27 October 2007 [29 January 2017]. ^ Police Administration Act (NT), Division 4AA in AustLII. ^ Anaya, James. Observations on the Northern Territory Emergency Response in Australia (PDF). un.org.au. February 2010 [18 June 2011]. （原始内容 (PDF)存档于20 April 2013）. ^ The World Today – UN rapporteur raps NT intervention 24/02/2010. Australian Broadcasting Corporation.au (2 October 1980). Retrieved 20 November 2011. ^ PM – UN's claims of 'racist' NT intervention are widely condemned 28/08/2009. Australian Broadcasting Corporation.au (28 August 2009). Retrieved 20 November 2011. ^ Defence, Discrimination and Regrets. Australian Broadcasting Corporation.au (11 April 2011). Retrieved 20 November 2011.